The New York Rangers are heading into a new era as a hockey club. For the last several seasons the Broadway Blueshirts were contenders in the NHL’s Eastern Conference, but they finally saw that run come to an end this season as they finished outside the playoffs for the first time since 2010. Their deadline fire sale saw one of the club’s many constants in Team Captain Ryan McDonagh, traded to the Tampa Bay Lightning. So, with the trade comes the need for a new captain, a player who can lead this team into a new age where they head back toward contention and out of the rebuild to come. A player who can set an example for the next crop of young Broadway stars. Plenty of fans have put forth their suggestions on who the new captain should be, and the most popular is Mats Zuccarello. “Zuuuuucc,” as he is affectionately known around The World’s Most Famous Arena, would certainly make a fine captain, but I have a different player in mind. One that is almost equally beloved since he entered the league back in 2012. I think Chris Kreider should be the next captain of the Rangers for a lot of reasons (aside from the fact he’s one of my favorite Rangers), so let’s break them down here. When the Rangers went ahead with the rebuild and made their deadline day trades, the stretch run of the season took on a new meaning. General manager Jeff Gorton said it was time every player, whether a new arrival or a hold over from years gone by, had to prove himself to earn a spot on next year’s team. A lot of players accepted this challenge from the boss upstairs and excelled, but perhaps none more so than #20. In the final 19 games following the February 26th trade deadline, Kreider registered 15 points. Kreider’s stretch run was arguably the best of his career, but that wasn’t just because of his point total. His overall game had come so far during this run. Kreider was able to combine his speed and size with the finer points of being an NHL forward. He played with more poise than previously in his career and seemed to show that years of experience had finally helped him become a better player. His improved two-way game made Kreider a more heavily featured player in settings that require some defensive responsibility, like 3 on 3 overtime periods. If you’re looking for evidence of his growth, check out the clinic he put on against the Penguins in a late-season OT win. When I think of Chris Kreider, this goal comes to mind above all others. New York Rangers forward Chris Kreider throws a shot at the net that banks off the skate of Montreal Canadiens defenseman Alexei Emelin with 28.1 seconds left. That game-tying goal from game three of the 2014 conference final is, to me, peak Chris Kreider. It was another huge playoff goal in a career full of postseason highs (including 23 career playoff goals), followed by a wild celebration. Ever since Kreider donned the red, white, and blue, he’s been a player who excites the Garden faithful. His high energy, bull-in-a-china-shop playing style could always swing a game in the Rangers’ favor. His passion in big moments are the emotions you look for in this sport when a player is in the middle of a critical game. To me, it always seemed as though Kreider fed off of that emotion in big games, something that was evident since day one against the Capitals in the 2012 Eastern Conference Semi Final. His play in the postseason and high-energy game translate well to leading by example, something that many Ranger fans felt Ryan McDonagh didn’t do enough of. These are all traits you look for in your leader, and Kreider could set a fine example for the new crop of young Rangers coming up through the system. Early in his career, Kreider was criticized for not playing a mature enough game. While he enjoyed antagonizing the opponent, he really didn’t know how to walk the line of controlling himself in an NHL game. He was also known to throw his incredible strength around at a dangerous level, which jeopardized other players on the ice. That’s something you simply can’t do in the modern NHL. During the 16-17 campaign, he seemed to finally show some maturity as a player in his career best season. But that was really just the beginning for him. After a decent start to the 17-18 season, Kreider missed a large chunk of games with a blood clot issue, a potentially life threatening situation for him. When he came back for that late season stretch, he played every game like there was no tomorrow, with the aforementioned passion and energy I spoke of above. This interview clip sheds a lot of light on Kreider’s growth on and off the ice. It feels like it’s been in a while since his 2012 debut, but Kreider is still just 27 years old and is signed through 2020. His overall game is perfect for the new NHL, a league largely based off of team speed. If Kreider picks up next year where he left off, he has the shot to be a star in the league and a centerpiece of the Rangers’ future. His clear chemistry with Mika Zibanejad gives the Rangers two-thirds of a top line, and it’ll be interesting to see who’s placed with them by the new head coach, whoever that may be. 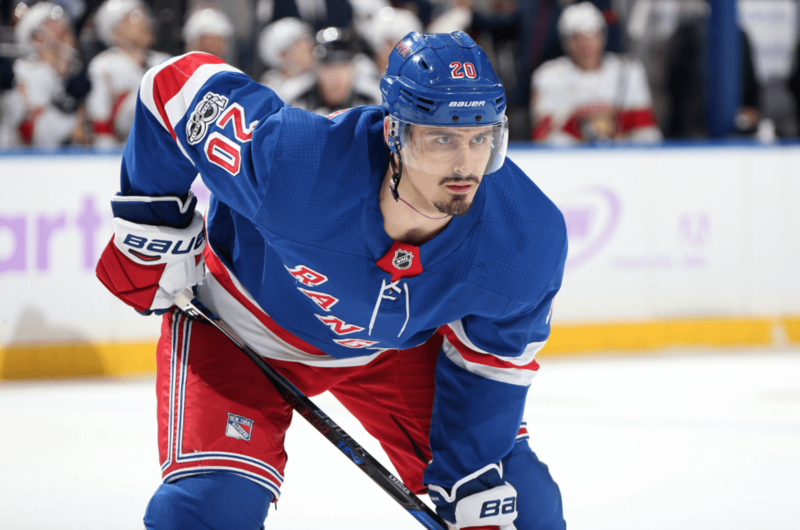 Kreider seems like a safe bet to last through another round of potential trades at the draft, which will, to put things bluntly, make him a favorite to wear the “C” next year. The aforementioned Mats Zuccarello is certainly a top candidate to captain the squad, but his name has been floated out there on the trade market. Young blue-liner Brady Skjei is a popular name to be the next blueshirts captain as well, but the Rangers just traded a defenseman who they felt they did no favors when they gave him the “C” at a young age. The next captain is just one of many choices the Rangers will make in the near future, among who to hire as their next head coach, who to pick at 9th overall, and much more. This figures to be a pretty entertaining offseason Ranger fans, which frankly can’t start soon enough, having just sat through a Ranger-less playoffs for the first time in 7 years. You can share your picks for captain with me on Twitter @PBPNick, as well as any other thoughts on the Rangers’ summer to come. I’ll have more Rangers content in the weeks to come as we head toward draft night.